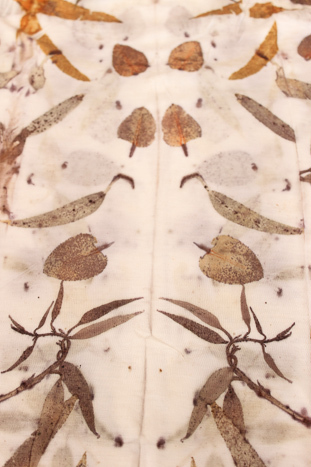 There is such a large variety of eucalyptus species and every eco print with those leaves will give different results, depending on the time of picking the leaves, the region, and the kind of water to simmer the bundles in. 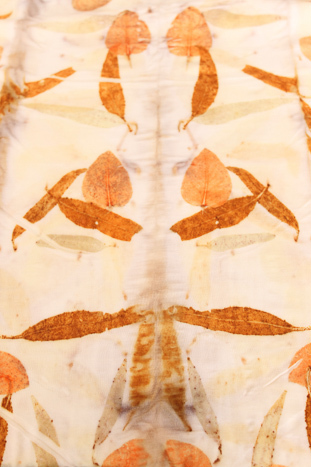 There is already so much written about it and I am not a scientist understanding the chemical side of eco printing, so I just did a little test with the same leaves dyed in the same pot, the same lengths of time, the same fabric (merino knit) . The only difference is that I soaked one fabric in iron water over night, the other not. This is the fabric not soaked. This is the fabric soaked.